One of the Manitoulin Area Stewardship Council's (MASC) many initiatives before it disbanded as a result of funding cutbacks and dissolved into Manitoulin Streams, was to encourage more extensive community involvement in the sustainable management of this area’s white-tailed deer population. To endure harsh winter conditions, deer typically migrate from their summer/fall ranges to winter concentration areas, termed as “deer yards”, which have suitable cover and food that will help to sustain them. These adaptations and good winter habitat enable deer to survive most winters, but under heavy snow conditions it may be necessary to pack-down deer trails and provide emergency feeding. These actions will help prevent massive die-offs and maintain core deer populations. 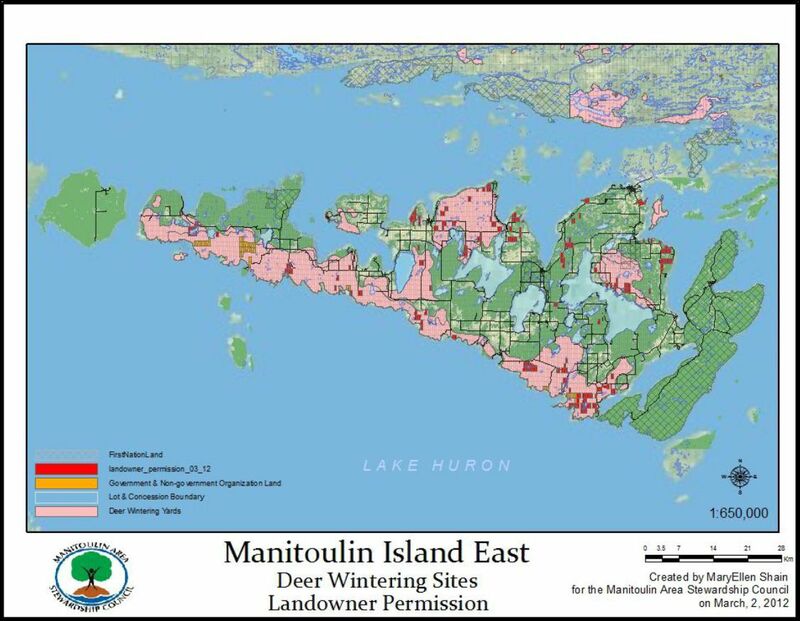 To avert this risk, MASC and other Manitoulin organizations have partnered to initiate the “Deer Save” project; to plan and coordinate preparedness for emergency winter deer situations. Landowners are being contacted if they have property that falls within an important winter deer yard. MASC is seeking permission to access the deer yards by entering landowner’s properties, should emergency winter conditions arise. Landowners are being asked to grant MASC permission to their property by signing and returning a landowner permission form and are being provided with a Deer Wintering Fact Sheet to inform them on what they can do to protect and enhance deer habitat.